The First Active House in Russia is designed to set a new standard for residential house construction in Russia. The house design is based on the Active House principles. 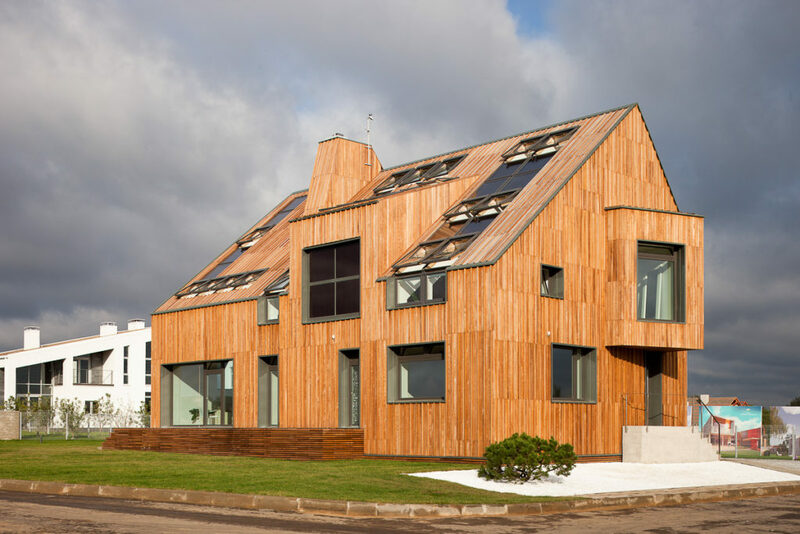 The First Active House in Russia is energy efficient and easy to operate. To reduce CO2 emissions and optimise energy performance, the building must be considered as a whole, not just the sum of its components. The house exploits a variety of energy sources that are integrated in the overall design. Free energy from the sun is the primary energy source of the house. 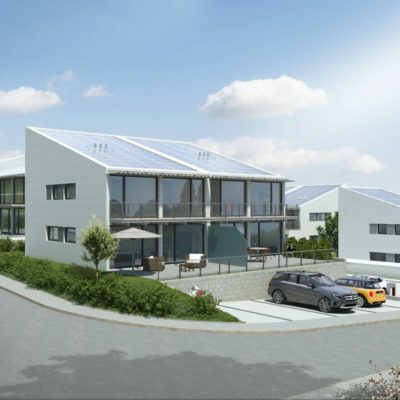 The features contributing towards a positive energy balance include a highly effective heat pump, thermal solar collectors for production of hot water and a PV solar cell system to generate electricity. VELUX solar thermal collectors designed for installation in combination with roof windows exploit the heat of the sun while providing a visually appealing and technically optimal solution. VELUX solar collectors can generally provide up to 65% of the energy required to produce domestic hot water. The sun is the most powerful source of energy we have and we should make maximum use of it. 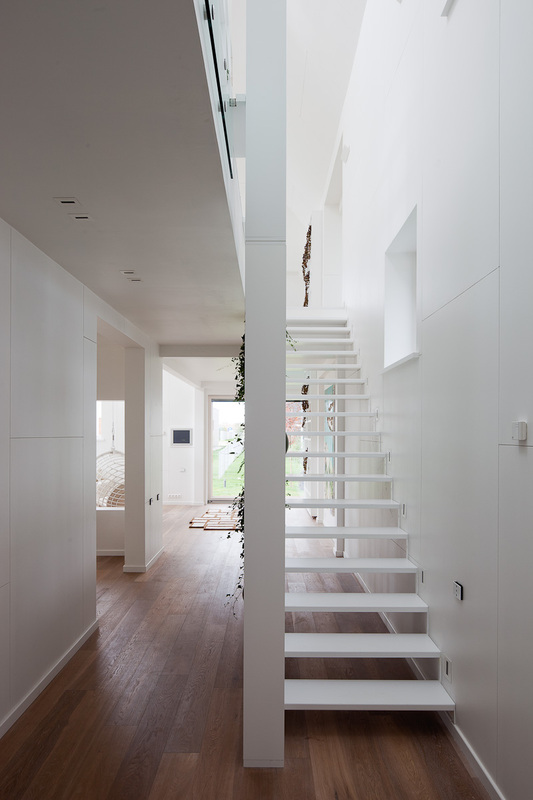 The orientation and design of the house make it possible to utilise daylight more actively. The windows should be considered as energy contributors. They are placed strategically to allow for solar heat gain and optimum natural ventilation. The energy requirement for basic lighting in large parts of the house is minimised by effective use of daylight. A tightly-sealed construction is vital for achieving low energy consumption. The walls are highly insulated with multiple layers. Special highly compressed gypsum is added on the inside of the walls to add thermal mass to the light timber frame construction. The results of an energy calculation performed by the Passive House Institute in Russia show that the specific consumption of energy for heating during the heating period is 38 kWh/m2/year. Total consumption of primary energy is 110 kWh/m2/year. 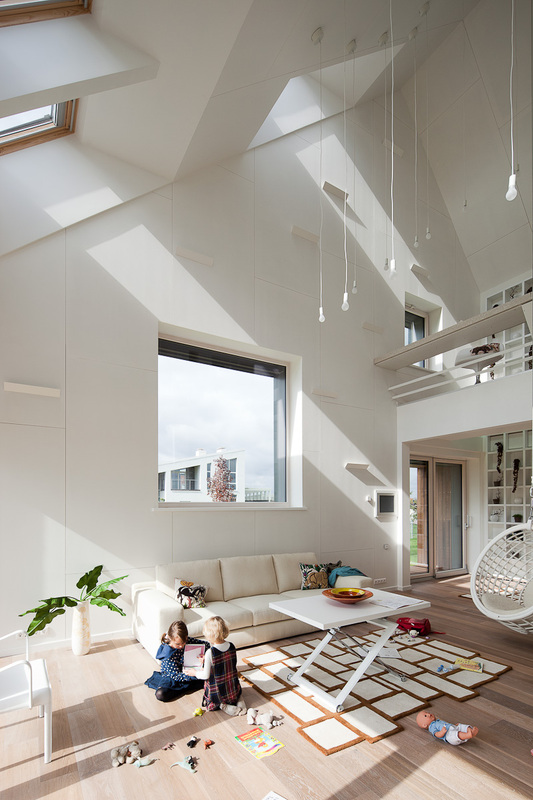 The First Active House in Russia offers a healthy and comfortable indoor climate with daylight and fresh air. The architects worked with variations of daylight in the different spaces and on ensuring attractive views of the surroundings with strategically placed windows. Through collaboration with the consulting engineers the design was optimised based on indoor climate tests performed in 3D simulations. In the project group the Active House principles created a platform where cooperation between architects, engineers and energy specialists became part of the creative design process. Thermal comfort in the warm summer months is achieved with natural ventilation; cross-ventilation and stack effect to maximise the ventilation rate. In order to provide a comfortable indoor climate all roof and facade windows are fitted with interior and exterior blinds and awnings. Glare and overheating during the summer are reduced with automatically controlled awning blinds. A comfortable indoor climate with natural ventilation is secured with the advanced home automation system by WindowMaster. The system can automatically open and close windows based on the CO2 levels in the house. The VELUX INTEGRA electrical roof windows, façade windows and all sunscreening products are integrated into this unique system. The WindowMaster system has a userfriendly and simple interface so it is easy to see the status of the products and operate them. The system used in the house is adaptable to the personal preferences of the residents. The daylight performance of the house has been specified using the daylight factor (DF) as performance indicator. The results of the daylight analysis show that all rooms that are used actively during the light hours have a daylight factor above 5%. 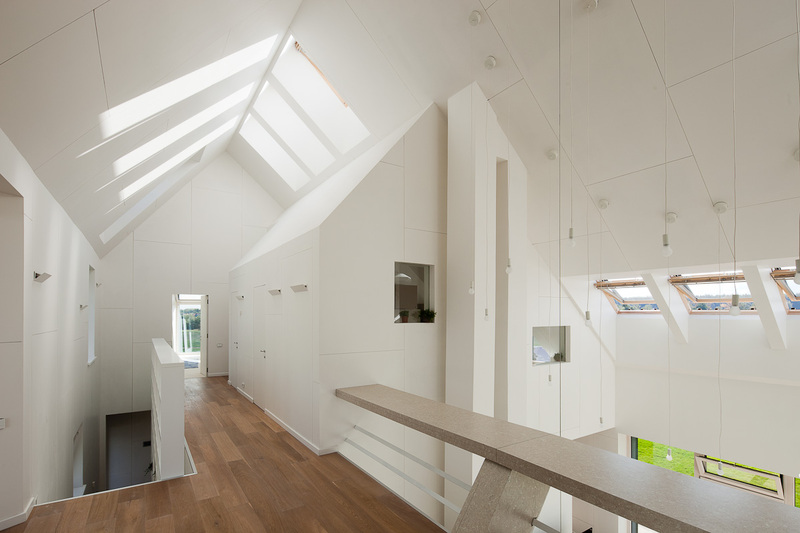 The roof windows deliver high levels of daylight in the centre part of the room. 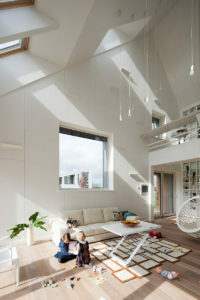 High levels of daylight in the home are proved to have potential for health benefits and increased alertness and safety. The project is adapted to the specific climatic conditions of Moscow, a humid continental climate with warm summers and long, cold winters. The building exerts minimum impact on the environmental and cultural resources. It is constructed of materials with a high recycled content and which provide the ability for own recycling or re-use. The homogenous material on the roof and facade is a reference to traditional Russian building methods. This solution is also ecological; the wooden facade is durable and has a low C02 impact. Pile foundation is used as basis for the construction of the house. The framework of softwood pine is assembled on site. To learn more about how the building will perform under real life conditions, data will be collected for reviewing and reporting the performance of the house. The monitoring will help determine the effectiveness of the architectural and technological solutions. The house will be open for the public for six months after completion, followed by a 12-month period with a test family. The vision of this new standard is to help shaping public opinion about sustainable habitats and to create a rating system for certification of “green” buildings and settlements to change the regulatory framework and legislation in the field of construction and architecture. The aim of the project is to become the first project certified by the Russian Green Standard. The Russian national rating system for certification of green building is based on European standards as a tool for the formation of “green” architecture. The standard supports the establishment of a certification system for building materials and technologies. Sustainable development of architecture will be the main objective of the Council to shape public opinion about caring for the environment and obtaining a healthy and comfortable lifestyle. The NLK House building company is responsible for the wooden house construction of The First Active House in Russia. The company is a recognised leader in manufacturing of products from deep wood processing in Russia. The NLK House building company has received a certificate from the Forest Stewardship Council. The FSC label means that the product is made of wood that has been felled without causing harm to the environment, animals and birds that inhabit the forest and the people living and working in the adjoining forest areas. VELUX roof windows have a long life span – up to forty years. Most of the timber used in making them comes from sustainable PFEC- or FSC-certified forestry. The glass and aluminium used in the windows can be recycled. The First Active House in Russia is designed to set a new standard for residential house construction in Russia. The house design is based on the Active House principles; balance between energy savings, healthy indoor climate and care for the environment, all adding to the architectural quality and well-being of the residents. The project is organized and developed by one of the leading developers in the Moscow region, Zagorodny Proekt company, in cooperation with the VELUX Group. The VELUX Group is working hard today on the solutions of tomorrow by promoting architecture that enhances our quality of life and the sustainable development of society. The project unites interested parties based on a balanced and holistic approach to building design and performance. It is supported by the Russian Union of Architects, the Active House Alliance, Russian Sustainable Building Council, Eco Standard Group, Passive House Institute Russia, Wood Housing Association, Construction Physics Scientific and Research Institute and the Russian State Construction University in St. Petersburg.